The proposed Gateway Pacific Terminal was proposed be located in Bellingham, Washington at Cherry Point, in Whatcom County. Sited between the Alcoa Intalco Works aluminum smelter and BP’s Cherry Point Refinery, the new construction of this coal terminal would cover approximately 278 acres of the 1,500 acre site. The terminal would be just north of the Lummi Nation on former reservation land (See Lummi & Coal). “Ferndale remains the city that Cherry Point built. The specter of coal trains that has generated major backlash in other cities along the line does not seem to have weakened support in Ferndale. The city is unlikely to turn its back on the jobs and taxes the Gateway Pacific Terminal promises” (McKay). There were several groups involved in the Cherry Point proposal. The Whatcom County Council has the power to issue a renewed shoreline permit necessary for work on the project (Washington State Department of Ecology). The Alliance for Northwest Jobs and Exports lobbied for the coal terminal. SSA Marine, which owns Pacific International Terminals, was the company responsible for proposing the Gateway Pacific Terminal at Cherry Point. The Army Corps of Engineers would ultimately approve or disapprove the terminal. The citizens of Whatcom County would have to watch the impact of increased coal train traffic with promises of permanent jobs. Perhaps most importantly, the Lummi Nation has treaty rights, and its burial sites and fishing grounds that are being violated by Gateway Pacific. (See: Lummi & Coal). SSA Marine accused the Lummi of planning to “seize” land to the Army Corps in an attempt to discredit the tribe’s opposition. Moreover, December 3rd, 2015 the U.S. House of Representatives countered the Lummi from further halting terminal progress, with a Republican bill backing the Crow Nation’s treaty right to profit from its coal being shipped out of Cherry Point (Lutey). Mark pointed to the fact that the SSA Marine’s proposal promised the community a “multi-faceted” port that would export a variety of products, including grain. He suggests that this was not a sincere declaration, and more of a way to distract the public from the real truth: that the Gateway Pacific Terminal was to be “a huge open warehouse for hundreds of millions of tons of coal.” The company’s rhetorical strategy resembled that employed by the Alliance for Northwest Jobs & Exports, a single-issue pro-fossil fuels group that advocates for fossil fuel development throughout the Pacific Northwest and into Canada. The Alliance website euphemistically refers to “commodity terminals” rather than naming the proposed projects as coal and crude oil export facilities. In addition to misleading the public, Mark implies that the SSA Marine has had local politicians in its pocket, including the “co-opted” mayor of Ferndale and “other small mayors of the Whatcom County area.” It was an election year full of “money and power and splitting of the unions,” he explains. Indeed, the Teamsters and the AFL-CIO both expressed support for the Terminal in a late September op-ed, citing the necessity of keeping the export industry in Ferndale (Hunt and Nugent). Although the leaders of both major unions were taken in by the SSA’s promise of living-wage jobs, some members remained in opposition to the terminal. The jobs rhetoric was the major strategy used by the pro-coal advocates, Mark says, and it was largely successful on the very local level. Moreover, Mark spoke of the inefficiency of using a large amount of land to create a very small number of jobs, especially when taken in context with the potential toll on the environment and the local fishing economy. If the Gateway Pacific Terminal is built, up to 18 coal trains a day would be running through Whatcom County. Coal trains are shown to pollute twice as much as freight trains in a study conducted by Western Washington University. (Plaven) Toxic particulates in coal dust such as arsenic, mercury and other heavy metals would cause a decrease in air quality. And train tracks run along some of the major waterways, including Bellingham Bay. Some of the possible alternatives to the proposed terminal are: alternative energy, including wind and solar power, further development of the fishing industry, environmental Tourism along the coast, finding economic opportunities that work with the land, as opposed to working against it, and working to restore salmon to the Pacific Northwest through hatcheries. In June 2016, the Lummi Nation prevailed in its fight to block the largest coal port ever proposed in North America, at Cherry Point.The U.S. Army Corps of Engineers, the agency reviewing permits for the deep water port project, agreed with the tribe that it could not grant a permit for a project that would infringe on the Lummi Nation’s treaty-protected fishing rights. The 34-page decision was celebrated by community groups and tribes all over the Northwest that opposed the coal port. The developer, SSA Marine of Seattle, declared the decision “inconceivable” and political, rather than fact-based. Bob Watters, SSA senior vice president and director of business development, said the company was “considering all action alternatives" (Mapes). Alliance for Northwest Jobs. (2015, April 22). Proposed projects create NW jobs. ANJ. EIS. Environmental Impact Statement: Proposed Gateway Pacific Terminal, Custer Spur (2012-2015 Gateway Pacific Terminal EIS). Lutey, T. (2015, December 3). House vote stops coastal Indians from blocking port for Montana coal: State-and-regional. Billings Gazette. Mapes, L. (2016, May 9). 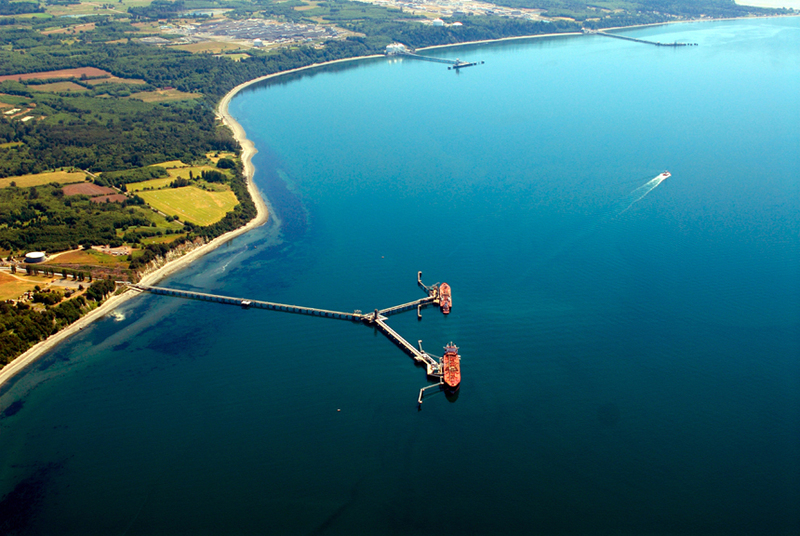 Tribes prevail, kill proposed coal terminal at Cherry Point. Seattle Times. McKay, F. (2013, June 12). Tale of Two cities: Ferndale welcomes big coal. Crosscut. Plaven, G. (2015, November 23). Study: Coal trains pollute twice as much as freight trains. East Oregonian. Schwartz, R. (2015, October 14). Coal fight spills into Whatcom's 'constitution.' Bellingham Herald. Zimmerman, L. (2015, December 1). The Fossil Fuel Industry and Ferndale: Fear and the 'Carrot and Stick' Approach [Personal interview].